I am SOOOOOOO excited! 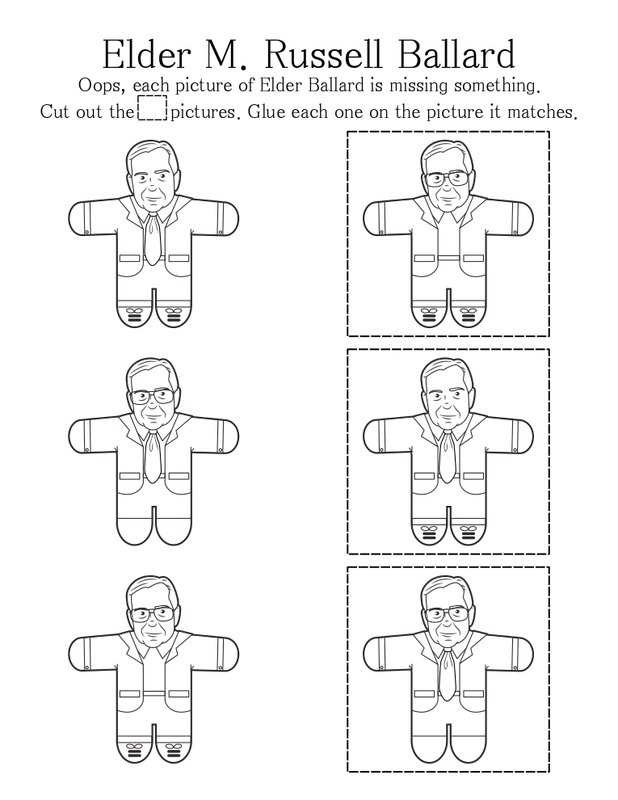 I got the thumbs up from Angela Roberts from scriptures4kids.com to post the activity pages I made up of the General Authorities using the fun coloring book images she has in her fantastic General Conference packets. I made these pages for last October’s sessions. My goal was to make one that was different for each of the 15 prophets, seers, and revelators. I only managed to come up with 6 different ideas last time – I simply ran out of time! (Not that it was a shocker to me that I ran out of time, but whach’a gonna do? I had to try at least.) I am going to post the 12 pages I made last time here. I am hoping to get a whole bunch of my new ideas created today and up for this coming General Conference, but again, time is only but so abundant when I literally only have today and next Sunday to do anything about it. For now, I am just SO excited that I can share these fun activities with you and I hope someone else’s kids can have fun with them. I felt totally selfish last October when my kids and my cute nieces were the only one’s that got to play with these activity and coloring pages. Woohoo! I am so excited for General Conference!!! I hope these can make someone’s Conference experience a fun one! (How could it not, when you get to help Elder Nelson get on a suit instead of jammies or do a dot-to-dot around Elder Perry’s glasses?) I hope you really do enjoy! Like everything on my blog, I am the creator of these images and they are put here for any personal or church use, but not for commercial use of any kind. The original images are used with permission. The original art is property of scriptures4kids.com. Thank you Angela for allowing me to use your images and post them here! Big ads on my blog come from the host company, to understand why they are here, please feel free to visit their explanation. I’ve contemplated moving my blog to a self hosted spot to get rid of them (less expensive than the cost to get rid of the ads), but I’m not sure I am comfortable enough yet to brave hosting it myself. Please forgive any inappropriate advertising choices made by my hosting company and have patience with my chicken attitude about self hosting. Thanks so much for these fun ideas! You are most welcome. I had likely far too much fun making and sharing them! These are SO CREATIVE and fun. Thank you os much for sharing them. I couldn’t help but giggle while printing them off because they’ll be so fun to do. THANK YOU! Thanks! I giggle too – every time I think about busting them out tomorrow! Thank you so very much, I just printed these for my 5 year old daughter! These are so PERFECT for her! these are darling! thanks for sharing! Thanks! You’re welcome. Have a blast! I think that these disrespect the apostles. They should be treated with more dignity than this. I am sorry to hear that, but I can understand the feeling. The original images were gratefully used by me, but not created by me. I have known many many people that use her darling accordion dolls and her TP tube puppets to keep kids engaged in Conference and have never heard ill spoken of her images. Which leads me to think that it is something about how I have used these images to create individual activities for each of the Quorum of the Twelve Apostles. May I ask a question? Is it all of the ideas that I shared here, or just the paper doll ones that have them starting in their pajamas? I ask the question in all sincerity. I even thought a lot about respect when I made these and again before I shared them. I especially debated that concern about the paper doll sheets. I decided it was the only way I could make a paper doll version of an Apostle and help the kids understand how they need to dress in the right kind of “Sunday best” clothes for General Conference. Little kid paper dolls often start with the children in underwear and an undershirt of some sort or another. That was OBVIOUSLY NOT an option this situation. The PJs were the only thing I could think of that would be natural, modest, and still allow for the ability to have General Authority paper dolls. I do apologize for the offense. It was unintentional. I honestly hope that if those brethren were to see these, they would not take it in any kind of disrespect, but would instead chuckle and contemplate if any of their grandkids (or great-grandkids) would be aided by using them during Conference. I hold these men in great respect and want my children to feel respect for them too. That is part of why I come up with ideas to get even my littlest ones involved in Conference and focused on the General Authorities and thinking about what they say. I’m most bothered by the paper dolls showing them in their pajamas. Think about the apostles and how positive and uplifting they are. When I saw the dolls in their pajamas, my first thought was, “Oh I bet Elder Nelson would LOVE this! I hope he can see it at some point!” I don’t find it disrespectful at all. The pajamas are tastefully done, so it’s not like they’re in their underwear (now THAT would be another matter entirely). The activity is to get them ready for conference. It’s a valid activity. Knowing what I know about the apostles, I really feel that they would be delighted to see them and know a fun activity has been created to help engage small kids and create a better experience for families watching conference. I personally ADORE them, and am excited for conference just so I can pull them out. I’m sure the apostles would appreciate our looking out for their dignity, but in this case, it’s my opinion that their dignity is left intact and I sincerely believe they would approve, and would encourage us to not be so easily offended. But that’s just my opinion and how I choose to look at it. I’m certainly not trying to pick a fight or anything, just hoping to offer another perspective. Happy Conference! Happy Conference to you – I hope it’s wonderful for you! Thank you! These are great! Love them! Thanks! I love the different things to do for the different speakers. Usually only the presidency gets individual stuff. Just curious, I don’t see any pages for the first presidency. Am I missing something? Just don’t want to miss out! Thanks! Boy do I ever understand. I made a list of all the things I would like to do in my spare time (spare time…hahaha) and projects I’d like to complete and estimate it would take me several years to complete the list. Several. Thanks for what you’ve done! Love them! Hi, I can’t seem to get Elder Cook and Elder Anderson’s pages to load correctly. Are they still on the site? Hi Jessica – Sorry I didn’t respond before Conference. I took an unplanned (not easy with six kids BTW!) trip to San Francisco the week before and including Conference! I am just now ALMOST recuperated and caught back up in my classes! These paper dolls are adorable! What a fun, different activity! This are awesome! Thanks for sharing! So happy I found your blog! One quick question. Maybe it’s my internet browser or something but I click on some of the links and they are duplicates. For example – Elder Bednar is Elder Nelson’s link. Has anyone else had this problem? Oh no! I’ll go look into it. That’s goofy and shouldn’t be happening. I’ll see what I can find out. Thanks for letting me know. I was on my desktop when I was having trouble. Now I’m on my cell phone and it worked smoothly. Thanks again! Happening for me too in Chrome on my laptop. SO weird! Thanks for these 🙂 I’m exicted to share them with my Toddler. The ones I can access anyway. Specifically Elders Bednar, Cook, and Christofferson load differently for me when I click the description rather than their names. If I click their names, they take me to the correct file. But if I click their description, Bednar = Nelson, Cook = Oakes, Christofferson = Ballard. Hope that helps 🙂 These are fantastic. I’m not sure if my other comment posted or not. But, thank you!! Also, I think that the pajamas are tastefully done. And that the apostles are men, who wear pajamas, and that it’s not disrespectful at all. If they were deities that we worshipped, then maybe it would be a different story, but I think this also helps humanize them, which is a good thing for boys and girls, to know that they are MEN who have chosen to serve God in this capacity. You rock. Thanks.